The British Commonwealth Air Training Plan (BCATP) was probably the largest training plan in the history of military aviation. It was to be responsible for training almost half of all pilots, navigators, bomb aimers, air gunners, wireless operators and flight engineers, who served with the RAF in World War Two. Trainees were drawn not only from the RAF, but from the Fleet Air Arm (FAA), the Royal Australian Air Force (RAAF), the Royal Canadian Air Force (RCAF), the Royal New Zealand Air Force (RNZAF) and from the various allied air force personnel that operated under the RAF auspice during the conflict. It was realised at an early stage that Britain would become unsuitable for elementary and advanced air-crew training because of the unpredictable weather, the considerable amount of operational air activity and of course the danger of enemy air interdiction. Negotiations regarding joint training took place in Ottawa at an early stage in the war with the first meeting taking place in December 1939. An agreement was signed on 17.12.39., calling for the training of 50,000 aircrews each year, for as long as necessary. At that time it was agreed that all aircrew were to receive elementary training before coming to Canada or the other nominated countries (South Africa, Rhodesia) to undertake advanced training (This would, of course, be changed later and all flying training would be undertaken in the host country). 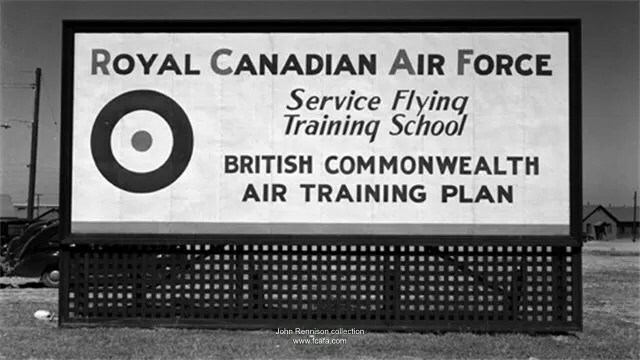 Article 15 of the agreement stated that trainees from Dominion Air Forces were to be assigned for service with the RAF and that Britain would be responsible for their pay etc once they were serving alongside the RAF. 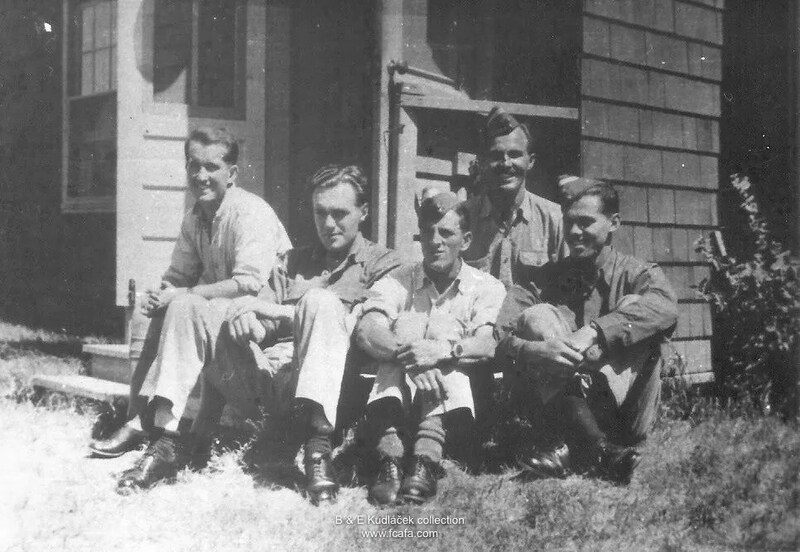 At the end of August 1940 personnel and equipment of No.7 Flying Training School, based at Westwood, Peterborough, were transferred ‘en-bloc’ to Canada. The unit was to become No.31 Elementary Flying Training School (EFTS), and was initially based at ‘Norman Rogers Aerodrome’ near Kingston in Ontario (Norman Rogers was a former MP and Minister of Defence with Mackenzie King’s government, who was killed in an air crash in June 1940). Initially, it was equipped with Fairey Battle light bombers, which were later replaced with the North American Harvard, a dedicated single-engined trainer. By June 1941 the unit had moved and was established at De Winton airfield near Calgary in Alberta. 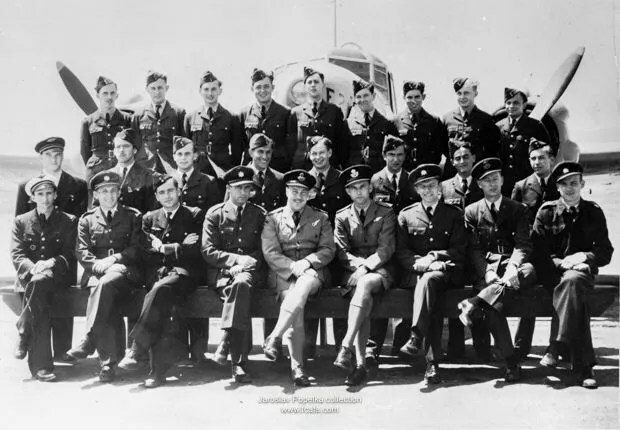 Between September 1940 and November 1944 a total of some 26 aircrew training establishments were to be set up across Canada, with a Personnel Depot at Moncton in New Brunswick. In addition, No.31 Radio Direction Finding (RDF) School was set up at Clinton in Ontario. Schools were set up in Alberta, Saskatchewan, and Manitoba. It was deemed politically unacceptable to establish any major flying training facilities in Quebec province. Trainees would usually arrive into either Halifax, Nova Scotia or New York City and would travel thence by rail to the Personnel Depot at Moncton. Once at Moncton they would be split into groups of roughly 50 personnel and would then move on to the various training establishments. New recruits from the Czech emigree community in Canada. 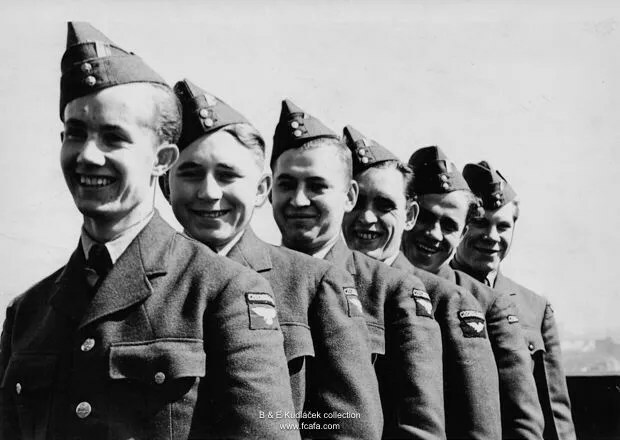 A Czech Military Mission arrived in Canada in the spring of 1941 and succeeded in recruiting a number of personnel for Air Force duties. The first Czechoslovak trainees appeared at schools in Canada during January 1942. In May 1942 a special conference was convened in Ottawa to discuss aspects of the BCATP. Delegates were invited not only from the participating Commonwealth countries but also from Poland, Free France, China, Belgium, Czechoslovakia, Holland, Norway, and Yugoslavia. New Czech recruits from Canada. More personnel were to be recruited late in 1942, a number of which came from the Czech 11th Eastern Infantry Regiment (which had seen active service in North Africa and had ultimately been renamed No. 200 Czechoslovak Light Anti-Aircraft Regiment, which was at that time, based at Haifa in Palestine). Early in 1943 a group of Czechoslovak army personnel who had volunteered for service in the RAF units, arrived in Britain. They underwent tests and medical examinations at the RAF’s Air Crew Receiving Centre before decisions were made with regard to which aircrew capacity they could be trained in. Fifty-five were chosen to undertake pilot training; thirteen were chosen for training as navigators; fifty-six for training as wireless operator/air gunners and five for training as flight engineers. Seven were found unsuitable for aircrew and thus were directed towards training in ground crew roles. After basic training in the way of their new service at the RAF’s No.4 Initial Training Wing, the navigators ‘set sail’ for North America. They arrived in New York and were then transferred to Moncton in Canada and thence to Lachine in Quebec. After a short interlude, they were posted to No.6 Bombing and Gunnery School (B&GS) at Mountain View, Ontario. The organisation for managing the BCATP was based on four Training Commands each of which was responsible for a region. A number of Manning Depots had been established; No.1 at Toronto, No.2 at Brandon, No.3 at Edmonton, No.4 at Quebec City, No.5 at Lachine in Quebec, No. 6 in Toronto (Women’s Division) and No.7 at Rockcliffe (also Women’s Division). Trainee pilots would initially undergo 50 hours of flying instruction over a period of 7 to 8 weeks at the nominated Elementary Flying Training School (EFTS). These units employed De Havilland Tiger Moth bi-planes and Fleet Finch or Fairchild Cornell aircraft. Graduates from the EFTS would be promoted to Leading Aircraftsman (LAC) and would move on to the Service Flying Training Schools (SFTS) for a period of up to 16 weeks. The first 8 weeks would be spent with the Intermediate Training Squadron, followed by six weeks of Advanced Training. They would finish up with a two-week spell at a Bombing and Gunnery School (B&GS). Fighter pilots would normally go to an SFTS flying North American Harvard or Yale type single-engined aircraft. Pilots destined for Bomber or Coastal Command units would normally go to an SFTS that provided multi-engine flying training, using aircraft such as Avro Ansons, Airspeed Oxfords or Cessna Cranes. On graduation they would be promoted to Sergeant (Sgt). Air Observers (later known simply as Navigators) would undergo 8 to 14 weeks of training at an Air Observer’s School (AOS) if required, followed by six weeks at a B&GS and a further month at an Air Navigation School (ANS). These latter schools were often managed by civilian contractors, but the instructors were either RAF or RCAF personnel. Navigational techniques would include; dead reckoning and visual pilotage. B&GS instructed in Bombing techniques and the use and operation of machine guns. They did, of course, require access to a bombing range and were often located near lakes or open prairie areas. They utilised aircraft such as Avro Ansons, Bristol Bolingbrokes, Fairey Battles and Westland Lysanders. Air Navigation Schools (ANS) were set up to run a four-week intensive course in astro-navigation. This was the last part of a navigator’s training. Amongst such units was; No.3 at Hamilton; No.31 at Port Albert and No.32 at Charlottetown. Wireless operator/air gunners would undertake 20 to 24 weeks training at a Wireless School. Here they would study the theory and application of wireless; plus learning Morse code, signaling using lights, flags, and radio. They would receive their ‘Sparks’ badge on completion. This would be followed by a four-week spell at a B&GS. Specialist schools (eg No.1 at Aylmer in Ontario) were also set up for flight engineers (who had become an essential member of aircrew, following the introduction into service of large four-engined aircraft). They would be taught how to manage an aircraft’s fuel, electrical and hydraulic systems. They were seen as the pilot’s assistant; helping with the operation of the throttles and distribution of fuel etc plus it was expected that in the event of an emergency they would be able to take over the flying controls. General Reconnaissance Schools (GRS) were also set up to provide advanced flying training for aircrews in the techniques required for operational ocean patrols. They utilised Anson aircraft and included; No. 1 GRS at Summerside, Prince Edward Island and No.31 GRS at Charlottetown, Prince Edward Island. This training represented almost the last step for aircrew trainees and the instructors would generally have operational experience. Was based at De Winton in Alberta in June 1942. It initially began flying training using the Boeing PT.27 Stearman bi-plane, which was replaced by the Fairchild Cornell Mk.II in May 1943. To begin with, the unit had a relief landing ground, a single grass strip, at Gladys. It also possibly used the relief landing ground at Inverlake. Instructors at De Winton (in late 1943) included P/O Josef Felka, Flt/Lt Josef KUBÁK and Flt/Lt Karel VILDOMEC. One of the pupils in 1943 was LAC Jiří BAUER, who went solo in a Cornell in the summer of that year. He was killed in action on 29.6.44., whilst strafing enemy columns in Normandy when serving with 310 Sqn. 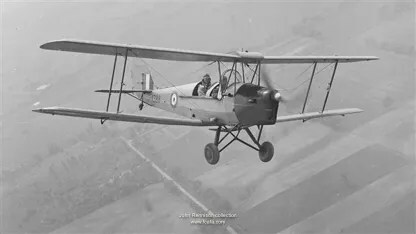 Bi-plane DH.82 Tiger Moths were also used by 31 EFTS from July 1942, starting with Course No.60 (This course consisted of eleven Czechs, 20 Dutch, 19 Free French, 3 Belgian and 1 Dane). Navigator P/O Miroslav PLAŇAVA was at the unit until February 1942 and navigator Sgt Zdeněk MUNZAR also served from December 1943 until May 1944. The unit was eventually disbanded in August 1944. 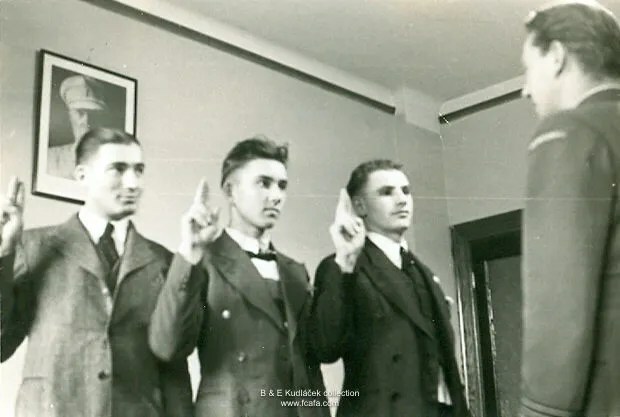 Czech trainee’s at Moose Jaw, 1943. 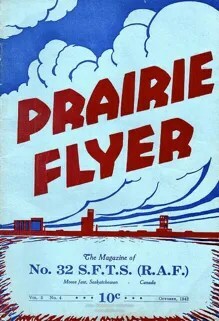 Originally opened in June 1941 at Swift Current in Saskatchewan during July 1942 but was later (11/42) established in Moose Jaw, Saskatchewan. It provided training using Airspeed Oxford Mk.II twin-engined aircraft. (eg BM354 ‘17’). The last course finished in September 1944 and the training was transferred to No.4 SFTS, using the more modern Cessna Crane Mk.1A (eg FJ-209) One of the instructors here was F/O Jindřich VNOUČEK who had earlier been an instructor at No. 37 SFTS based at Saskatoon. On the 8th of July 1943, a horrific incident took place when Oxford trainers AS625 and AS229 collided in mid-air on approach to Moose Jaw and crashed. Czech Instructor 118740 F/O Benedikt BLATNÝ DFM and his pupil, trainee pilot 788331 LAC Svatopluk MALÝ were both killed. The RTAF crew of the second aircraft, Instructor P/O George Moffat URWIN and his pupil LAC Alfred Charles CHANNON were killed also. Navigator P/O František KREJČÍ served here until April 1944, together with Navigator Sgt Karel RYBNÍČEK, who left at the end of March 1944. 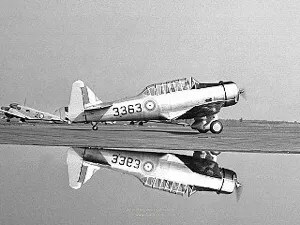 Was based at Medicine Hat, Alberta, using the North American Harvard II single-engined trainer. It was originally formed in February 1942 at Assiniboia in Saskatchewan. Czech instructors were in evidence for some two and a half years, with the last three leaving in October 1944. The longest serving was Flt/Lt Rudolf ZIMA who spent 18 months on the unit (He had previously been an instructor in both Czechoslovakia and France and had also served with 310 Squadron. He had instructed at 3 EFTS and 22 EFTS in Britain before leaving for Canada in 1942). 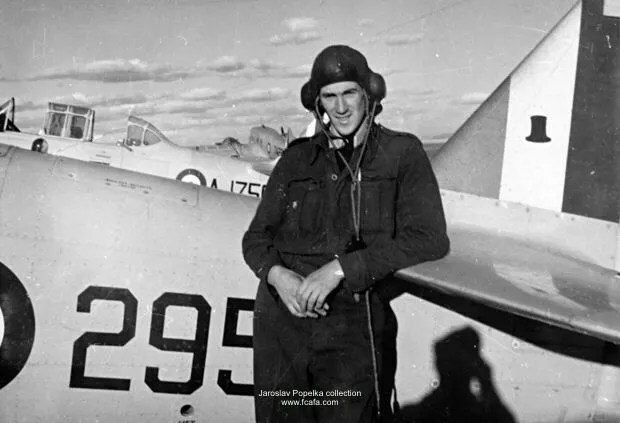 A tragedy occurred on the 12th of December 1943 when F/Sgt Bohuslav PŘÍHODA 787087 crashed in Harvard 2742, whilst carrying out aerobatics. The aircraft was seen to dive into the ground and burst into flames on impact. PŘÍHODA was buried in the Hillside Cemetery at Medicine Hat three days later. When training here ceased in the latter part of 1944, it was transferred to No.13 SFTS at North Battleford in Saskatchewan. Commencing with Course No 113 in August 1944. Navigators P/O Vladimír VÁVRA and Sgt Bohumil RYŠÁNEK were both with 34 SFTS until March 1944.The unit was re-designated at 25 EFTS early in 1944. Czech trainee’s from Medicine Hat. Was based at Port Albert, Prince Edward Island. Trained here were P/O Bohumil Sigmund (10/43 to 11/43) and P/O Václav HOŘEJŠÍ, who on completion of their training were posted to 111 OTU. Navigator trainees’s, including Czechs, at Mountain View, 1943. Was based at Mountain View in Ontario close to Belleville. Course No.72, which ran from 6.1.43. to 19.3.43. (provided Navigator ‘B’ Bomb Aimer) training and was attended by 9 Czech personnel; 1st.Lt. František KREJČÍ, 1st.Lt. Vladimír VÁVRA, 1st.Lt. Václav HOŘEJŠÍ, Lt. Robert SIGMUND, Lt. Miroslav PLAŇAVA, LAC Antonín NĚMEC, LAC Bernard DEUTSCH, LAC Bohumil RYŠÁNEK and LAC Karel RYBNÍČEK. LAC Jan MUNK undertook the training with course No.76, which ran from the 6th of February to the 2nd of April 1943. A further group of 15 Czechoslovak trainees arrived here in early 1943 to undertake the Navigator ‘B’ training; it consisted of Snr.Lt. Karel ŠTĚPÁN, Snr.Lt. Ladislav SNÍDAL, Snr.Lt. Antonín MRVÍK, Snr.Lt. Kondrat Smahel, Snr.Lt Arnošt ŠVERMA, Snr.Lt. Miroslav SOBOTA, 1st.Lt. Eduard WICHTA, 1st.Lt. Bohumír KRÉZEK, 1st.Lt. Vilem KAUDERS, 1st.Lt. Jaroslav DOLEŽAL, 1st.Lt. Vladimír VANĚK, 1st.Lt. Jaromír DANĚK, 2nd.Lt. Josef HOŘEJŠÍ, 2nd.Lt Robert KOBLOVSKÝ and Engineer Aspirant Bohuslav KERVITZER. They were part of Course No.77, which ran from 5.4.43. to 28.5.43.and had completed their basic navigational training at No.1 Elementary Air Navigation School (EANS) at RAF Bridgenorth in the UK. They used the twin-engined Bristol Bolingbroke IV and the Avro Anson II for training purposes. The trainees would put in up to 15 hours flying time on the Bolingbrokes, training in gunnery and firing off up to 300 rounds. 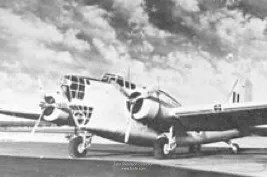 They also carried out up to 34 hours (including between 4 and 6 hours of night flying) of practice bombing on the Anson trainers. Sgt Zdeněk MUNZAR undertook the training with Course No.90B. Was based at Summerside, Prince Edward Island. Trainee navigators were expected to complete 9 or 10, 3hour cross-country flights in Anson aircraft whilst with the unit. The first group of Czech navigators to undergo training on the unit consisted of; P/O Ladislav SNÍDAL, P/O Eduard WICHTA, P/O Wilem Kauders, P/O Arnošt ŠVERMA,, who attended course No.59 which ran from 5th of May to the 15th of June 1944. At the end of the training P/O KAUDERS and P/O WICHTA both departed for 111 OTU. Course No.65A, which ran from 31st of June to the 18th September 1944, was attended by a four-man team consisting of; F/O Ladislav ŠTĚPÁN, F/O Vladimír VANĚK, F/O Jaroslav DOLEŽAL and F/O Robert KOBLOVSKÝ. On completion of the training F/O ŠTĚPÁN was posted to No.31 GRS to act as an instructor. From the 20th of October to the 1st of December F/O Bohumír KRÉZEK and F/O Miroslav SOBOTA trained at the GRS as did F/O Jaromír DANĚK and F/O Václav HOŘEJŠÍ between the 10th of December 1944 and the 19th of January 1945. Navigators Sgt Antonín NĚMEC and Sgt Bernard DEUTSCH were also at the unit during November 1943. Both went on to spend time with 31 GR Squadron in Charlottetown. Navigator Sgt Jan MUNK also served here in June 1944. Was based at Charlottetown, Prince Edward Island. Czechoslovak pilots would arrive here having passed through the EFTS/SFTS training and progressed onto multi-engined aircraft (usually the Airspeed Oxford or Cessna Crane). 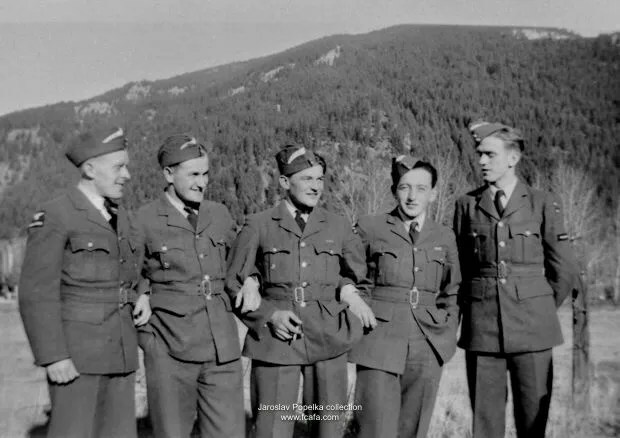 During the latter half of 1943 a number of pilots passed through the GRS; F/O Vladimír Slansky (a former Wop/Ag), F/Sgt Miloš ŠAFRÁNEK, W/O Gustav NETREFA (later transferred to the RCAF), W/O Jindřich BENEŠ (a former AG), Sgt Robert KRUPICA, Sgt Lubomír VOLKA, Flt/Lt Karel KVAPIL. Between September and November 1943 Sgt Josef ŠNOBL and Sgt Miroslav POLACH underwent training at the GRS. They were followed in November by P/O Jiří OSOLSOBĚ (a former WOP/AG), Sgt Miloš BODLÁK, Sgt Bohuslav PAVLÍK (later transferred to the RCAF). They made up Course No.119B, which ended on the 4th of February 1944. Course No.121A ran from the 13th of December to the 18th of February 1944 and consisted of P/O Antonín VRCHOTKA, P/O František KAVÁLEK, Sgt Jan ČEKAL and Sgt Bohumil PROKOPEC. Course No.129 which ran from the 14th of February to the 14th of April 1944 consisted of Flt/Lt Jiří ENGEL (a former Navigator), Sgt František BRET, Sgt Zdeněk PALME and Sgt Miroslav PAVLOVSKÝ. They were followed by Course No. 138 which consisted of Sgt Karel FIALKA, Sgt Ilja HRUŠÁK and Sgt Zdeněk LIPA. The latter two airmen were destined to become staff pilots on completion of their training. Sgt František KRÁL, Sgt František MEZULÁNÍK and Sgt Miroslav SEDLÁČEK attended Course No.156 which ran from the 21st of August to the 20th of October 1944. Course No.160 involved Sgt Emanuel BRTVA, Sgt Jaroslav LOVĚTÍNSKÝ, Sgt Václav KADLČÍK and Sgt Vladimír SOCHOR. Sgt Jaroslav HOLÝ took part in Course No.167 from 6th of November to the 5th of January 1945. From the latter part of 1943 Sgt Antonín NĚMEC, Sgt Bernard DEUTSCH and Sgt Jan MUNK were present on the unit as assistant navigational instructors. Was based at L’Ancienne-Lorette, Quebec. Navigators from a range of allied nations were trained here (Belgian, Czechoslovakian, Dutch and Norwegian). The unit utilised the Avro Anson Mk.I and Mk.V for carrying out a range of cross-country flights. Trainees would be expected to complete approximately 120 hours of flying time including up to 47 hours at night. Amongst those who underwent training here were; Snr.Lt Karel ŠTĚPÁN, Snr.Lt Ladislav SNÍDAL, Snr.Lt. Arnošt ŠVERMA, 1st.Lt Bohumír KRÉZEK, 1st. Lt Václav HOŘEJŠÍ and LAC Antonín NĚMEC, finishing in August 1943. LAC Jan MUNK also underwent training here during 1943, as did LAC T FOLDES, who did not complete his training. Snr.Lt Kondrat SMAHEL and Lt. Bohuslav KERVITZER did not complete their training and both returned to the Czechoslovak Army Depot in Britain in November 1943. Flt/Lt Herbert NĚMEC, a navigator, arrived on the unit in December 1943 to act as an interpreter and assistant instructor. Czech aircrew also carried out duties with a range of RCAF maritime squadrons, which were mainly part of 1 Group, Eastern Air Command. 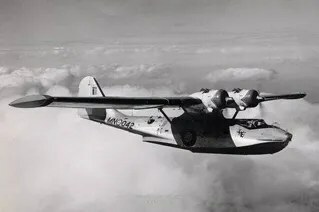 They included; No.5 Bomber Reconnaissance (BR) Sqn based at Torbay, Newfoundland, which operated the Consolidated Catalina ‘Canso’ Mk.II amphibious aircraft. 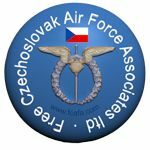 Czechoslovak airmen operating with this unit were Flt/Lt Herbert NĚMEC from the 12th of December 1943 to the 2nd of April 1944, P/O Josef HOŘEJŠÍ and P/O Eduard WICHTA from the 12th of December 1943 to the 4th of May 1944. Based at Torbay, Newfoundland, which operated Lockheed Hudson Mk.III aircraft. 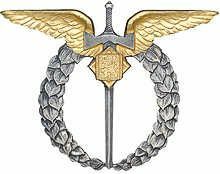 P/O Vilem KAUDERS and P/O Arnošt ŠVERMA were involved with this unit from the 12th of December 1943 to the 4th of May 1944. 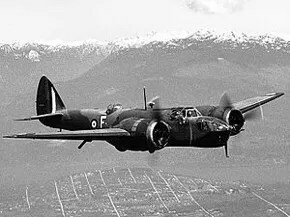 No.113 (BR) Sqn based at Sydney, Nova Scotia, which operated the Lockheed Vega Ventura GR.V. P/O Josef HOŘEJŠÍ served with this unit from the 8th of May 1944 to 15th of June 1944. No.116 (BR) Sqn based at Sydney, Nova Scotia, with a detached element at Goose Bay Labrador, which operated the Consolidated Catalina ‘Canso’ Mk.II amphibious aircraft. Czechoslovak airmen operating with this unit were; F/O Bohumír KRÉZEK (25.12.43. to 31.5.44. ), P/O Jaroslav DOLEŽAL (25.12.43. to 31.5.44. ), P/O Antonín MRVÍK (24.4.44. to 31.5.44. ), F/O Jaromír DANĚK (24.4.44. to 10.12.44. ), F/O Josef HOŘEJŠÍ (16.6.44 to 10.12.44. ), F/O Miroslav SOBOTA (11.9.44. to 20.10.44. ), F/O Robert KOBLOVSKÝ (18.9.44. to 9.12.44.) and F/O Vladimír VANĚK (18.9.44. to 30.10.44.). Based at Sydney Nova Scotia, which operated the Lockheed Hudson Mk.III aircraft. P/O Miroslav SOBOTA was with this unit from the 25th of December 1943 to the 31st of March 1944. Based at Dartmouth Nova Scotia operating the Lockheed Hudson Mk.III aircraft. Czechoslovak airmen serving with this unit were P/O Robert KOBLOVSKÝ and P/O Vladimír VANĚK (5.1.44.to 28.2.44.). Based at Dartmouth, Nova Scotia (and from June 1944 at Gaspé, New Brunswick), which operated the Douglas DB-1 Digby aircraft. Czechoslovak airmen operating with this unit were F/O Robert KOBLOVSKÝ (2.12.43. to 5.1.44.) and F/O Vladimír VANĚK (1.3.44. to 15.7.44.). On successful conclusion of their training in Canada, they would then be posted to Operational Training Units (OTU) to further hone their new skills to an advanced level prior to being posted to an operational squadron. For the Czechoslovak pilots who had been trained for the role of fighter pilots, these would return to an OTU the UK learn the ‘tricks of the trade’ before posting to either 310 Sqn, 312 Sqn or 313 Sqn for operational duties. For other pilots, who were deemed suitable for flying within Coastal Command, along with navigators and air-gunners, they would be posted to 111 OTU, Coastal Command’s training base in the Bahamas, where they would ‘crew-up’ and learn how to operate as a crew in their new role with Coastal Command, prior to posting back to the UK to join 311 Sqn. The BCATP was wound down in the latter part of 1944, when aircrew numbers began to go into surplus. It was officially closed down on the 31st of March 1945. A huge number of training establishments had been set-up and during their existence, they had taken on 159,340 trainees (including 49,507 pilots), out of which 131,553 had successfully completed their training. This entry was posted in 310 Sqd, 311 Sqd, 312 Sqd, 313 Sqd, 68 Sqd, Information, Personnel. Bookmark the permalink. A really interesting post that has filled a large number of gaps. Thanks. Very interesting article. This confirms something my father, Karel Vokoun, told me concerning flight training with Tiger Moths. Up to this point I haven’t had any confirmation of that, so I thank you for this information.